Why it matters: With Apple now using facial recognition in addition to collecting fingerprints, it wants to reassure customers of the steps it takes to protect the data. Also, as all varieties of smartphones contain a treasure trove of personal information, Apple aims to make its strong privacy stance a selling point. Face ID: As we've written, Apple is taking pains to make sure that the face recognition data stays on the device and can't be accessed by governments or others. To train the neural networks that power Face ID, Apple obtained (with informed consent) more than a billion images of people, including depth and infrared scans. There's more detail in a new page on Apple's Web site. 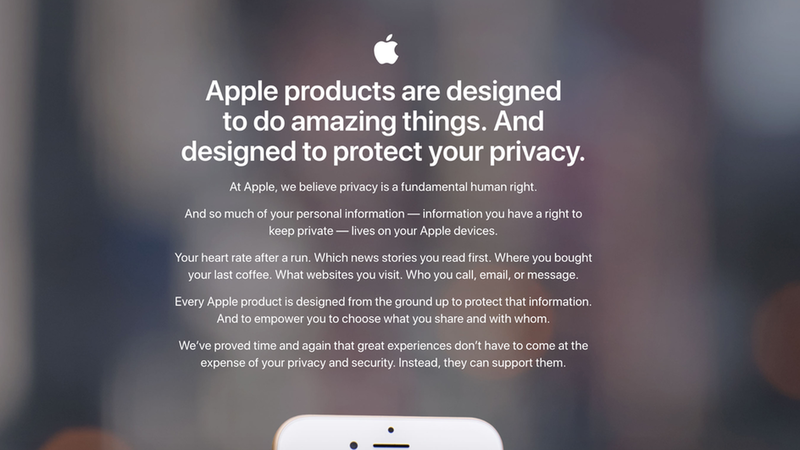 Differential privacy: Apple is expanding the areas where it collects user data but pledges to anonymize it. Data collected is obfuscated so that Apple cannot confidently guess what contributions an individual user has made. One new area where Apple is collecting such data is around Web sites, where it is trying to identify Web sites that often crash or drain the battery. Another thing Apple is exploring is which categories of health data that customers are using (but not the actual health data). For example, Apple is collecting whether people are storing heart rate data, but not their actual heart rate. Disabling tracking cookies: One of the moves Apple is making is to offer the ability to block the cookies that track you across multiple Web sites. It's not an ad blocker -- you will still see ads, just not those targeting ones that serve up the same ads for the shoes you looked at once. The bottom line: Apple needs more data to compete in key areas of machine learning and collecting that while preserving privacy requires a lot of creativity and striking a fine balance.